Abjayoni is one among the numerous names of Brahma, the creator. Abjayoni means ‘one who is born of a lotus.’ Legend has it that Brahma appeared from a lotus emerging from the navel of Bhagvan Vishnu. In Hinduism a cycle of creation comes to an end with the great deluge. On the waters of the great deluge, Bhagvan Vishnu alone floats atop a banyan leaf. Then Jagdamba (Goddess Shakti) appears before the Vatapatrashayi Vishnu and reminds him that it is time for the next cycle of creation. 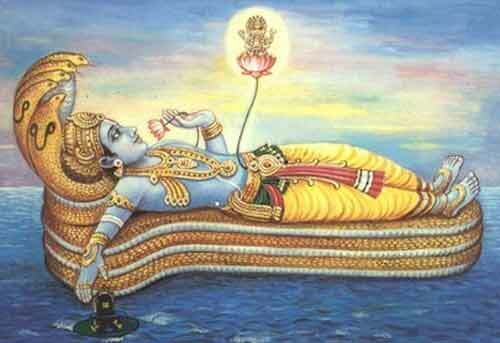 Then from the navel of Vishnu appears a lotus with Brahma atop it - Abjayoni. Brahma then pays his respect to Jagadamba and Vishnu and begins the next cycle of creation. Brahma then creates the Saptarishis and Prajapatis. All living beings are then created.